Fresh passion fruit juice is surprisingly acidic, at pH 3.0 the same as vinegar. Orange juice is pH 3.4 to 4.0. Lemon juice is pH 2.3-2.5. I think the critical factor is probably fermentation rather than extreme acidity though of course the seed coats will be softened by it. The juices will ferment quickly, as with some other presoak treatments. Dry seed contains germination inhibitors, probably abscisic acid. This is poorly soluble in water but much more soluble in alcohol. Fermentation, which happens naturally in fruit in nature, produces alcohol which may then penetrate the seed coat & speed the leaching out of the abscisic acid. There appears to be an optimum fermentation time which is related to temperature…and of course to alcohol levels. Too high of either for too long becoming inhibitory. There is plenty of evidence that fermentation works & indeed may be essential for some fruit e.g. tomatoes & Cucurbitaceae such as melons & gourds…..but no firm proof yet re Passiflora. A presoaks in alcohol itself such as diluted beer may also work. For dry seed in particular & as it won’t do any harm & may help worth trying. I sometimes use fresh passion fruit juice as a presoak for stubborn dry seed that is reluctant to sink and ferment it for several days. Presoak in tea. This is a tricky one. Tea contains compounds such as flavonoids which may help germination in older secondarily dormant seeds of some species, suggesting that flavonoids play some as yet unknown role in controlling seed dormancy. Flavonoids are essential for germination, anthocyanin biosynthesis is integrated with seed maturation and dormancy via the ABA gene in some, but not all, plant species. Some of this information from work by Brenda Winkel Shirley (1998). At the same time there is the phenomenon of Allelleopathy, whereby some plants produce chemicals specifically to discourage germination of the seed of others. Caffeine which tea contains is an example of this. So on balance tea although it seems tea is unlikely to be of help, but that said Patrick Worley uses it and I have found it works well too. ‘Make a strong infusion of black tea. Use only black tea. I have found that the tannic acid in the black tea simulates the rotting and the leaf mold chemicals found in the natural environment. Use four to ve tea bags in 12 ounces of boiling water. Let the tea steep until the water is room temperature. Squeeze out the tea bags and discard them. It only takes enough tea to cover the seeds in a small cup or container. Put the seeds in small plastic cups and pour in the tea, covering the seeds. If the seeds are white or not fully mature they will often oat after a soaking and should probably be discarded. I use plastic labels and soft pencils to label the seed type, the date, and where the seeds were collected or purchased. After a 24 hour soak, carefully strain the tea from the seeds. Place the seeds on a paper towel to dry a bit. Use small shallow pots and a sterile potting mix. I use my own mix*. Any good seed medium should work well. Make sure that there are drainage holes in the pots. Wet the medium thoroughly and allow it to sit for a short time to make sure that the mix is evenly moistened. Plant the seeds in even rows close together. I often plant all the seed that I have if the age is not known to me. Using a pencil as a dibble I make evenly spaced holes and plant the seeds about 0.5 cm apart and cover. Water gently to settle the seed and then allow the excess water to drain. Place the at or ats depending upon size, in a clear plastic zip bag and seal after blowing in a bit of air to slightly in ate the bag. Put the bags in the sunniest part of the greenhouse in full light. I use my window sill in the south window to get them as warm as possible. I then put them outdoors in full sun anchoring them to insure the wind would not disturb them. I check after 4 or ve days. When the seeds are just starting to germinate I move them to a brightly lit area to continue the sprouting process. e rst few times I tried this method I was surprised that the seeds sprouted like grass. I had planted very thickly thinking that maybe a few would geminate. at had been my experience. I now plant carefully anticipating that any good seed will germinate. This is a plant hormone that amongst other things can promote seed germination. I do not recommend its use however as there is little evidence that it is helpful for Passiflora. Do not use it at all as a presoak unless it is your last resort. It will damage easy to germinate seed. It can cause seedlings to be too tall & thin & possibly distorted.The exact correct amount for each species may be of help but who knows it? The seed will produce its own GA-3 anyway when inhibitors are leached out. If you want to try it however, for very reluctant seed try a presoak in GA-3 to break dormancy. Dissolve a 100 mg packet of GA-3 powder in 100 ml of distilled water to make a 1000 ppm solution. It dissolves very slowly in cold water, best left overnight, or hot water can be used. This solution once made up will keep for years even at room temperature if kept in the dark. To use mix some with an equal part of distilled water to make up 500 ppm solution. Try this first, soaking seed for 24 hours or more before blotting off & planting. If nothing comes up in say a month then try the 1000 ppm solution neat. Its also good idea to plant some untreated seed at the same time as a control for comparison. Always use the weakest solution that works. For worldwide supply of GA-3 starter kits with all you need & info in great depth I recommend J.L.Hudson Seeds. The above para summarises info from there. This is interesting. It may reduce fungal problems and it increases O2 availability compared with H2O, though that may be of no consequence to the seed. Some seed coats release reactive oxygen intermediates such as H2O2 as part of the germination process. Greg Cunningham uses Patrick Worley’s method of black tea soaking overnight, then soak another day in 3% H2O2. Fresh milk typically has a pH of 6.6, as it curdles this reduces to about pH 4.5. I have germinated P. antioquiensis seed soaked in milk but would not recommend it. It could reduce the seed coats’ permeability by clogging it up. This is often used to stimulate germination of dormant or difficult seeds. Say 2 grams per litre. Worth trying with problem seed. It is very important that whatever soil is used should be very light or the roots, of some species particularly, will not be able to push through it. Slightly more acidic soil e.g. peat based may be best. May be of use either after fire treatment or on its own with specific species such as P. cinnabarina which germinate in the wild after forest fires. Ian Webb however has germinated P. cinnabarina by the traditional method of neglect with no special treatment. Probably it has to be a lot more dried out than most other Passiflora. Sulphuric acid is used commercially to remove arils en masse from P. edulis but this is a bit aggressive & done for a short time only. A long soak would kill the seed. Dangerous. This can be very useful if only to restablish capillary action through the seed coat to the embryo, particularly if the seed is dry. It is likely that many of the other exotic presoaks appear helpful simply because they ensure the seed is fully hydrated. Nevertheless many of the organic molecules present in them may interact unpredictably with the embryo for better or worse. 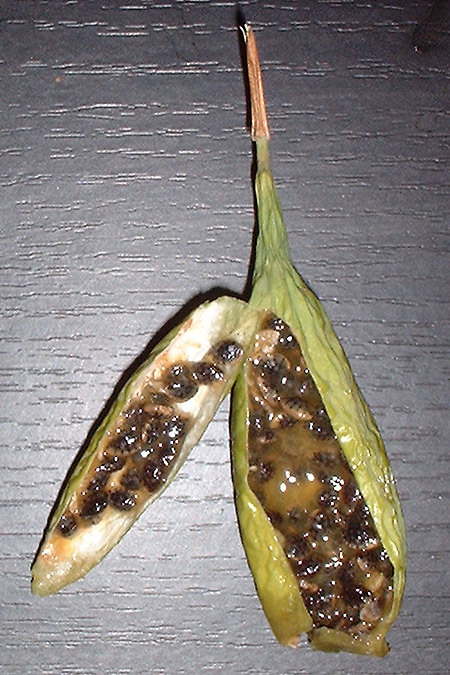 It is generally accepted that Passiflora seed that sinks quickly is more likely to be viable…& although reluctant sinkers may be OK, floaters, which will often be pale as they are unripe & if opened are often empty, can be discarded as unviable after 48 hours. If there are germination inhibitors present, John Vanderplank suggests the seed may further benefit from being soaked for longer periods from a week to 30 days with the water being changed daily & being kept in a heated propagator. This allows the seed to become fully plumped up with water & helps leach out the abscisic acid which in not very soluble in water. Soaking may also protect the seed from future inadvertent under-watering after sowing. This will do no harm & may help. The only exception to this rule is that seed that comes up easily e.g. P. caerulea & its hybrids may burst if oversoaked so 24 hours is enough for them.For really tricky stuff I would presoak for 24-72 hours at warm room temperature or in a propagator followed by a period of say 7 days washing out in warm water.